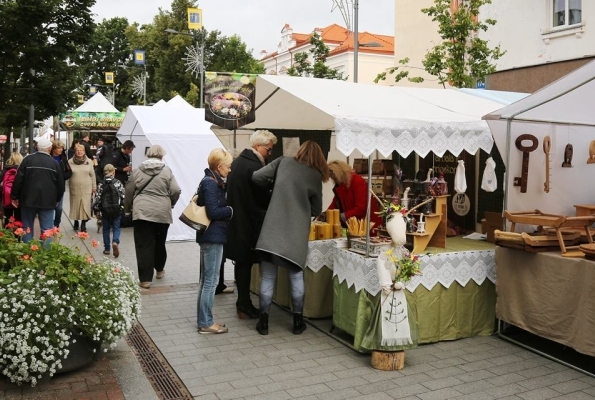 We invite you to take part in the centenary fair of city festival “Šiauliai Days 782”, which will take place on the 6th ,7th and 8th of September, 2018 at 10.00–19.00 in Vilniaus St. boulevard in Šiauliai. Organizer of the fair ‒ Šiauliai Cultural Centre (hereinafter the Organizer). Coordinator of the fair ‒ a manager of cultural activity of Šiauliai Cultural Centre Zita Mundinienė. Registration deadline is the 10th of August by e-mail zitamuge@gmail.com. Participants of the fair have to pay fee for the permission to trade and provide services (hereinafter the Fee) until the 23rd of August. The information on concrete trading places will be provided to participants of the fair until the 5th of September. The working time of the fair – the 6th, 7th and 8th of September, from 10.00 until 19.00. Venue – Vilniaus St. boulevard in Šiauliai, a section between Tilžės St. and Žemaitės St. Participants – legal and natural persons. The number of fair places is limited. Information is available by phone 8 614 19 562. Persons who wish to trade or provide services in the fair have to submit all necessary documents until the 10th of August, 2018 by e-mail zitamuge@gmail.com. Documents indicating a participant’s legal activity and status (identified in the application form). The Fee is paid only after receiving the confirmation about successful registration! If the Fee is paid before the confirmation of registration, the money is not returned. Document confirming the payment of the Fee. Without payment of the Fee, the reservation of trading place is deleted and according to the suitability of the content and the order of other registered natural or legal persons, who have registered but due to lack of trading places have not received a trading place, are invited. 2. Persons who have a valid administrative penalty for violations of public order, financial discipline, commercial or economic activity, veterinary and sanitary rules, rules of cleanliness and handling, waste management rules and other violations related to the activity performed. Participants of the fair have to pay the Fee until the 23rd of August and send a copy of the proof of payment by e-mail zitamuge@gmail.com. The final trading place in the fair will be given to participants of the fair only if they have paid the Fee before the scheduled date. The provision of simple amusement services – 0,1 Eur per1 sq. m.
The Fee for the participants of the fair is for one participant’s place per one day. The Fee is paid before the authorization is issued. AB “Swedbank” LT89 7300 0100 0240 8128. In the line “Purpose of payment”, the following has to be written “For the issuance of a marketing authorization (provision of services) in public places”. Participants of the fair who will have paid the Fee until the 23rd of August will be provided with a concrete trading place in the fair and they will have been informed about this until the 3rd of September by e-mail. The authorization is granted only upon confirmation of payment of the Fee. The authorization will be issued upon arrival at the place of the fair. Trading places are distributed by the Organizer. At fair place it is necessary to have the following: an authorization, identity document; work certificate; business certificate or individual activity certificate, and other necessary documents. In case of unforeseen circumstances, the trader must immediately inform the Organizer by e-mail zitamuge@gmail.com, phone 8 614 19 562. 1. To trade in goods whose retail in public places is prohibited by the laws and other legal acts of the Republic of Lithuania. 2. To trade in goods or provide services if they do not meet the safety requirements established in the laws, technical regulations and other legal acts of the Republic of Lithuania. 4. To engage in activities other than those which have been agreed upon with the Organizer. 5. To transfer the trading place or service to persons other than those entered in the business license. NOTE. Natural or legal persons who have received a trading place but who have not arrived at the fair, the Fee is not refundable and they will not be allowed in the future to participate in fairs or markets by the Organizer. The Organizer has the right to adjust the rules.